I want to thank Ann Mazzoli for sending a couple examples of visual management that was used out in the retail environment. 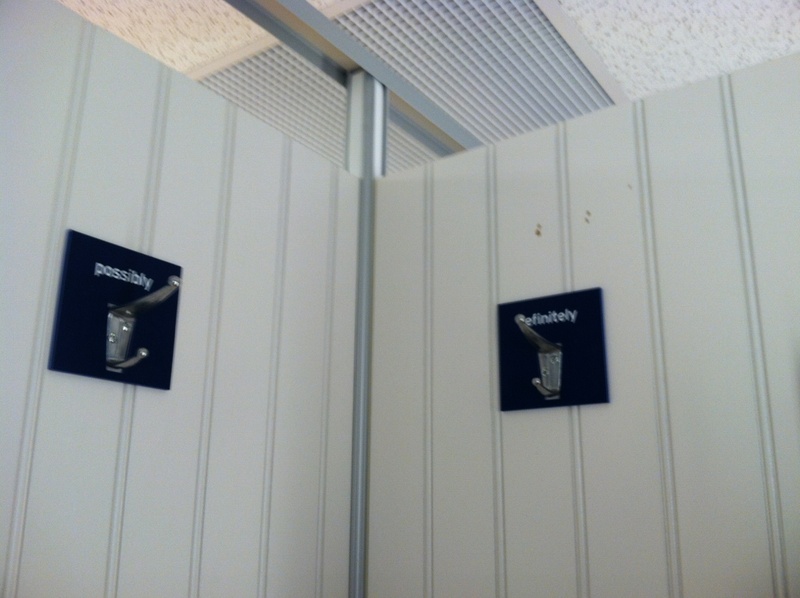 The examples are from a dressing room. This first example is very clear and can be understood as to how it could help the shopping experience. When trying on clothes, I always separate them into two piles after I have tried it on. No/Maybe and Yes. This shows clearly a place to hang the clothes to make it easier. 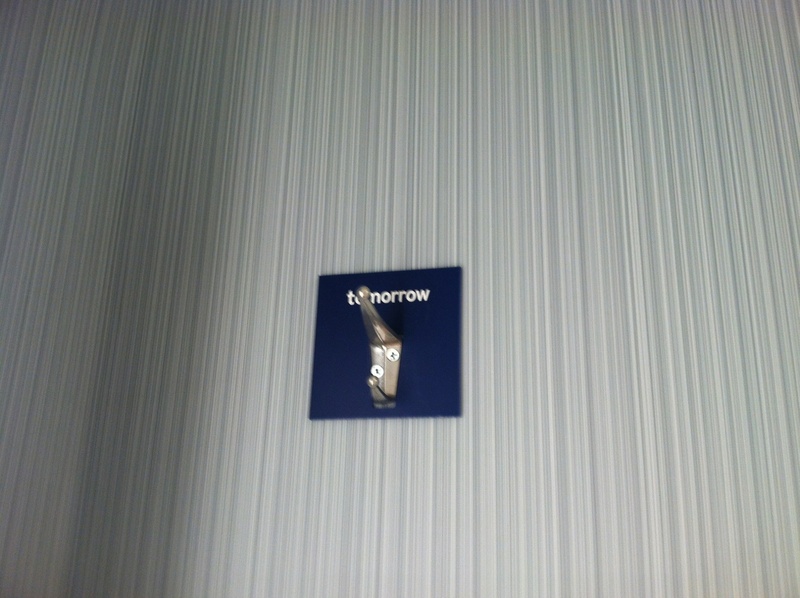 I have no idea what “Tomorrow” would mean for a dressing room experience. Do you know what it could mean? Visual management and labeling is great, but it has to be clear and understandable by the people that will use it. If anyone else has any examples please feel free to share them. There has been much in the news about Greg Schiano, head coach of the Tampa Bay Buccaneers. He has lost the respect of his players and last week it showed when they looked like they just quit on him during the game. I hate to see players quit trying. That is something that I find appalling. With that being said, I actually get it in this case. Greg Schiano has handled confidential situations with his players poorly and bad mouthed the fans in the media. This will not help a coach get the respect of his players and therefore the players won’t want to play hard for him. Unlike, Chuck Pagano who has earned the respect of his players in Indianapolis. The Colts are a good team playing great because of the effort they put forth. They respect their head coach and are playing as hard and disciplined as they can for him. This is no different in business. This is why there is so much talk about being a great leader. Jim Collins pointed some of the same great leadership tactics in business that you see in football coaches in Good to Great. Art Byrne is a great example of this in business. He led by example. Art gained the respect of the people working for him. They followed because they wanted to and the results of that showed. In business and in sports, a leader must show people their vision in a way that inspires and motivates them to want to go there…not be forced there. Being forced never earns the respect of people. People are smart and see when then are being disrespected. Become a great leader and it changes how the game is played. A common concept discussed with lean is setting up work in a value stream and not functional silos. This means getting people from cross functional areas to sit and work together in a work cell. An example would be someone from customer service, credit check and order writing all sitting together to make the work of order taking flow. This allows for the handoffs to occur immediately and increased communication between the functions resulting in reduced lead time and better quality of work. Agile is a great example of putting the work cell concept into action. An agile software development team brings the business partner, software developers, data managers and quality assurance together in one room. This allows for quick turnaround discussions when someone is stuck getting to a resolution quicker and moving the development along. There are many other aspects to agile but the work cell is a instrumental component to allowing many of the other concepts and tools to work so well for an agile team. Work cells are not just for the manufacturing floor. They are applicable anywhere you need to bring cross functional teams together in order to drive a quicker more efficient process. Over the years I have continued to learn how to communicate better. Through lean I have learned how to communicate more clearly using illustrations and eliminating the “other” information that isn’t necessary to get my story told. One tool that has helped me communicate more clearly is the A3. The limited space really focuses me on what is important to talk about. Understanding waste, and not wanting to duplicate my work I use my A3s in during discussions with groups of people instead of creating a multiple slides in PowerPoint stating the same words. If I need a drawing to support my discussion, I use a white board or chart pad to draw it out, because the drawings can take time to recreate in PowerPoint. We are taught the A3 is a communication tool. Don’t duplicate work. The story is important and that is what needs to be communicated. WARNING!!!!! Know your culture and where you are in your lean journey at all times. After the first few times of using A3s and chart pads to communicate within my current company, I was pulled aside by a couple of senior leaders and told that I come off as unprofessional and not prepared because I didn’t use PowerPoint. Having no filter, I asked if it was better to spend three hours working on the issue or three hours putting together PowerPoint? I also asked how I came off unprepared because I could answer any question they had about the issue? Aside: you might consider how you are talking with before being that direct. The point is, the leadership and culture at that time were not ready to be communicated with in that fashion. If you are in a similar situation, I would recommend using slides as a supplement to the A3. Yes, it would be overprocessing waste, but it is better then people not listening because of a format issue and having to rework everything. I saw a post last week on the Harvard Business Review blog about thinking inside the box. The title caught my eye, but when reading the post it wasn’t what I had expected. The post was about how to find ideas for innovation and improvement from within your company. Great premise and I completely agree. My thoughts about thinking inside the box have to do with creating and living by standards. I work for a company with an extremely large creative staff. At one time the largest creative staff in the world. So, standards were frowned upon because it was thought to “box in” the creative talent in their designs. As lean started to be implemented throughout the company, standardized work and product standards were an uphill battle. After some discussion, we were able to get some standards in place. The most interesting part has been the reaction from the creative staffs. After working within the standards, they have said they have become more creative. Thinking inside the box (or within the standards) has freed them from thinking about certain aspects of product design and allowed them to be creative within the space given to them. This is a concept that is commonly misunderstood with lean. Standardized work and product standards are not there to hamper creativity or take the thinking away from the work. They are there to free up the peoples minds to think about the work in new ways. Not think about the mundane aspects of the work. Don’t fight standardized work, use to become more creative. There is a new Walmart being built near my house. It is just a couple of weeks away from opening. As I drove past, I noticed the lines for the parking spots were two different colors. The lines for the spaces that are near the building are painted white. The lines for the spaces away from the building are painted yellow. I had my suspicions as to why and they have been confirmed. The spaces painted that are away from the building are there to indicate where employees can park. The white spaces are to be reserved for customers. Auditing will only be effective if Walmart employees have some kind of sticker or indicator on their car. Or do they trust their employees will do the right thing? Note: I tried to take a picture but couldn’t get at a good distance and elevation to show the parking lot effectively. Last week I got to spend some time with my coach, Jamie Flinchbaugh. It has been awhile since I have seen him and the time was very well spent. He met with the entire group I work with. During that time, we talked about problem solving and how important it is to have a coach when learning good problem solving. He reiterated that this is why practicing with a coach is so important. Just like in sports, a player practices with a coach so he knows he is doing the right things. The same is true for problem solving and lean. My first coach was Dennis Mouser. He spent about 3 days a week with me helping me learn a good problem solving methodology and making sure I practiced it correctly. It has been eight years since we have worked together but what he taught me is embedded in what I do when solving a problem. Speaking from experience, a coach is an investment that everyone learning lean and problem solving should make. They will help you practice the right things so it becomes permanent. I am way behind in my blog reading. When reading some of my backlog, I found this great post by Brad Power over at Harvard Business Review. Why was it great? Brad talked about how meeting the customer expectations and operational excellence are not opposites. Business should be doing BOTH and the ones that do have great success. What is more important to company success, a strong external focus on customer experiences or an internal focus on effective and efficient operations? Of course, it’s a false dichotomy — you need both. I described in an earlier post how Tesco worked for years to improve its supply chain capabilities, then leveraged this value by using deeper customer knowledge to enrich customer experiences. Brad uses two great examples. One is L.L. Bean that provides goods to consumers. The other is ThedaCare which provides medical services to people. He shows how meeting customer expectations and having operational excellence can work in either industry. Many hospitals began pursuing the “triple aim”: better patient experiences, consistent quality, and lower costs. Hospitals such as Virginia Mason and ThedaCare adopted process improvement systems from manufacturing (“Lean” and the “Toyota Production System”) to deliver increased consistency, reliability, and quality. While skeptics are right when they say, “Patients are not cars,” the reality is that medical care is, in fact, delivered through extraordinarily complex organizations, with thousands of interacting processes, much like a factory. Most in the lean community are aware of the great work ThedaCare and Virginia Mason have been doing. It is great to see it highlighted on the HBR Blog. Something that the lean community has stressed for a very long time is focus on delivering value for the customer first and then determine how to deliver that value as efficiently as possible and with no waste. There is so much written about lean that is wrong or misunderstood. It is great to see a post discussing how companies can use lean properly to help them compete and win. cristhiancanhaIs lean really into customer service? I mean, I know is written and said but, is it really that way?